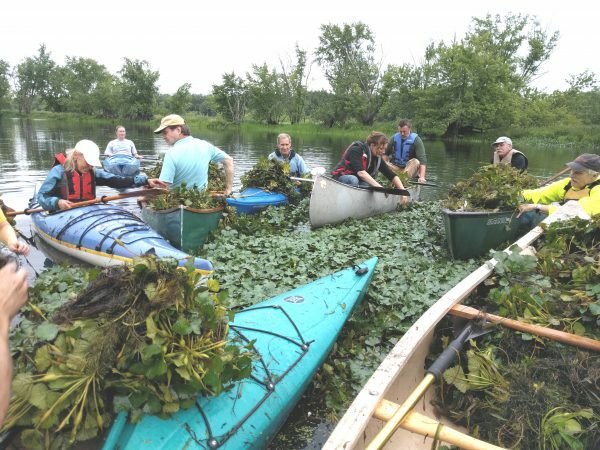 This coming Sunday, September 16, from 9 to 11 a.m., paddlers will unite in a big effort to remove the remaining water chestnut plants from the lower Mattabesset River in the Floating Meadows between Middletown and Cromwell. If we can get about 20 paddlers, we have a good chance of clearing the main stem of the river for the first time in 5 years. We will launch from the canoe and kayak launch at 181 Johnson St. in Middletown. For last minute questions in case of iffy weather, call or text John Hall at 860-398-3771. While we prefer not to schedule paddles on Sunday, we are doing so in this case due to the Sunday availability of paddlers with canoes and in order to have higher water in the ebbing tide. Tide will be high at approximately 8 a.m. on Sunday. Tide is one hour earlier on Saturday. Bags and gloves will be provided. Paddlers are required to wear life jackets and to sign a Jonah Center liability waiver and photo permission form. A porta-potty is located at the launch site.